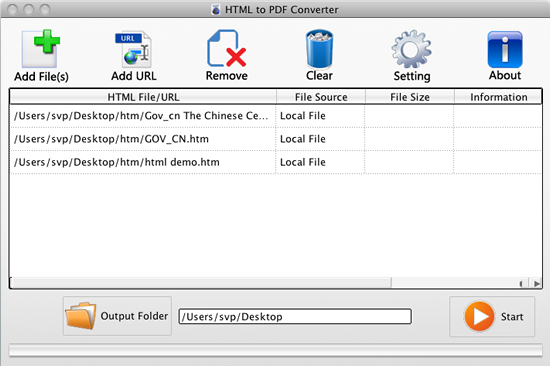 HTML to PDF Converter for Mac can be used to batch convert HTML files to PDF files on Mac system. HTML to PDF Converter for Mac is a smart and powerful tool specially designed for Mac OS X system. It can be used to convert .html, .htm, URL, etc. file to PDF document just by some easy clicks. In the conversion procedure, you are able to set PDF paper size, orientation, font size, edit PDF contents such as no image, no background, etc. HTML to PDF Converter for Mac fully supports to convert batch web URLs to PDF files and it also supports CSS style and JS functions during HTML to PDF conversion. * Smart and quick batch process. * Customize PDF page size and orientation. * Be able to read lots of URLs and path of HTML files from a .txt, .rtf or .ini file. * Support dragging and dropping input file. * URLs can be links to HTML, MHTML, ASP, PHP, and any other types. * Support CSS style and JS functions during HTML to PDF conversion. * Support more than 10 paper types. * Support setting PDF orientation and font size. * Allow you to set HTTP Authentication username and password. * Support to edit output PDF in conversion procedure: No hyperlink, Grayscale, No Image, Low Quality, etc..
* No need for any third-party PDF related software for conversion to PDF. * Support HTML pages with elements of asp, cgi, css, Java Applets, flash, cookie. * Able to create a multi-page PDF file for all pages of a website automatically. * Able to convert newly created files in specified directories in unattended mode. * Support drag and drop operation for GUI version. * Customize paper size for HTML to PDF conversion. * Set page orientation (portrait or landscape) for HTML Conversion. * Automatically adjust PDF width. * Retain hyperlinks from HTML to PDF. * Rewrite links in local HTML files if necessary. This entry was posted in HTML & PDF to ePub Converter, HTML Converter (htmltools) and tagged htm to pdf, html converter, HTML to PDF, URL to PDF, webpage to PDF. Bookmark the permalink.